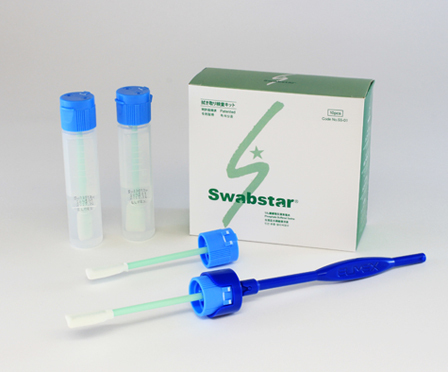 ■ Hygiene & Environmental Testing Swab kit "Swabstar"
ALL-IN-ONE, ready to use self contained swab and diluent system. 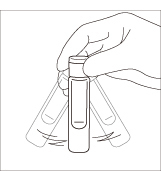 The swab sample solution is ready by returning the swab stick after swabbed to the container. Amount of note of sample solution can be done to a plate and a medium without the pipet because Scale has adhered. (1) Ready to use self contained swab and diluent system. 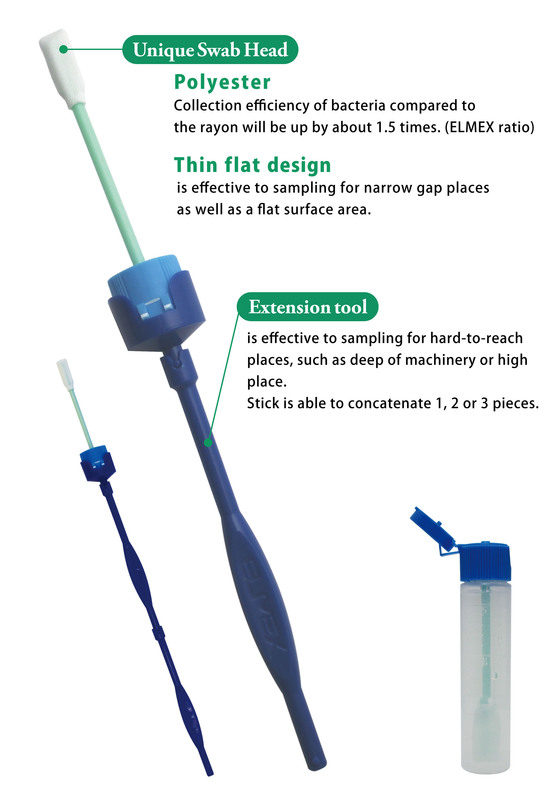 (2) Swab head of Thin flat design is effective to sampling for narrow gap places. (4) Using the extension tool (optional), can sampling for machine deep parts, pipes and high place. (5) For with the dispensing function (patented), the pipette is also unnecessary. Reach to a distant or narrow place with extension tool(optional). The length of extension tool stick is 155mm including capper. 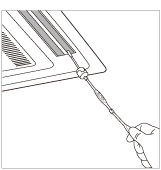 Stick is able to concatenate 1, 2 or 3 pieces. Because flat and thin, can wipe off the details. 1mL is dropped to media while seeing the line of the amount of the scale that adheres to the bottle side. 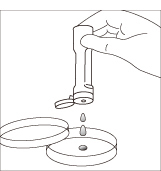 Two drops can be dropped to applying because one drop is about 50μL and Conrarge be applied. medium, the pipette is unnecessary. One drop is about 50 micro liter. The cost can be saved. 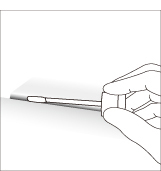 Open the top lid from the cap of the Swabstar, then inject it with Pro･media ST-SSP. Swabstar that the medium enters is cultured for 24 hours by 35〜37 degree. If it change to blue, coliform is positive, and E.coli is positive if fluorescence by irradiating ultraviolet rays (λ366nm).